In the world of scripted television, writers have what’s called a show bible. The bible serves as a reference for better understanding the characters, settings, and plot situations of that particular showe It also serves to teach new writers how the “universe” of that show works. Great, Mr. TV. 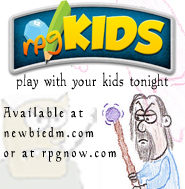 What does that have to do with being a newbie dm and playing D&D? 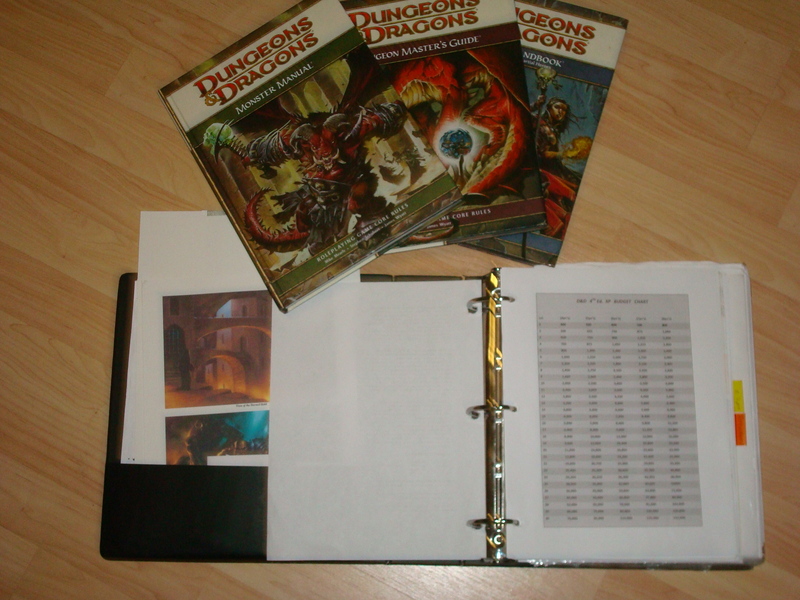 One of the most important tools a newbie DM can have in his gaming arsenal is a good binder. This binder should serve as your bible for your campaign. It can include NPC’s, maps and other stuff to help you have a complete view of your game. I use a thick, hardback 3 ring folder for my binder, but there are plenty of other options. A campaign calendar. This is always a good idea. If a player asks you what time of the year it is, it’s better to say something like: “Oh, it’s Festival of the Sun Week. Priests of Pelor, remember its your duty to offer free healing in towns this week to the people. Pelor is watching.” than saying, “Eh.. um, it’s summer. No wait, it snowed last time we played, it’s a well, it’s like almost spring…” A campaign calendar is easy to create. Stick to our earthly calendar and change some names. Add a monthless floating week here or there for some religious purpose and voila! Download a calendar and stick it in your notebook. It can also help you track players’ use of daily powers if you’d like. Town names. Keep a list of generic town names, so if your players stumble unto a town, you are ready for it, and aren’t fumbling around for a name. “You’re in Springwell” sounds better than “Hmmm, Yeah, you enter town X.” Here is a fantasy town name generator I found. NPC’s and Quests. I’m a firm believer in having a bunch of generic npc’s ready for action, and for these npc’s to have minor quests ready to go, just in case. Here is a great collection of 4th Ed. NPC’s, ready for action. They just need names. I once got asked by one of my players if he could find any odd jobs in the megalopolis I had them in. For me to say no was in all honesty, ridiculous. In a city that big, something had to have been available. But I had nothing ready. 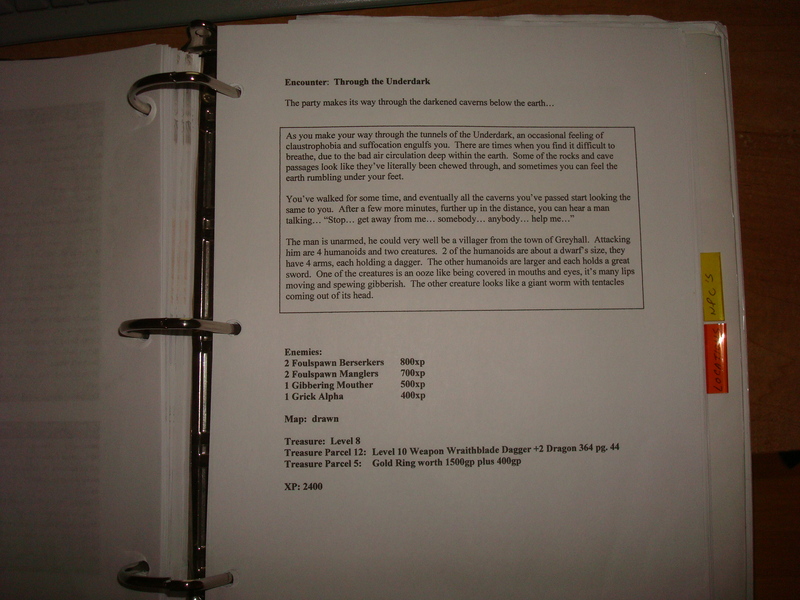 The dungeon delve book can serve as inspiration for these “off-campaign” assignments for money. Newbie mistake that a good DM notebook can help with. Reference Sheets. I keep copies of the XP encounter builder table, references for random things like menu items from taverns, coin conversions, stuff like that. Maps. Search the net for maps. The old Wizard’s Map-A-Week archive is great for this. The PC’s enter a town, give them a map. Just photoshop out the names to fit your own, and there, done. Your town is mapped. So you didn’t create the map yourself, big deal. Players love maps. Have maps ready in your binder, maps of taverns, sewers, streets, or anything else you can get your hands on. Your player’s character sheets and backgrounds. These are always necessary to reference potential story limelight elements for your pc’s. Random encounters. Have a couple of things ready to roll out a moments call. A bar brawl, an alleyway fight, a sewer encounter. These things are easy to create in 4th edition and you can keep using them again and again discreetly. Just “re-skin” them. Your guys like to fight at bars? have a couple of standby encounters created. Locations. By this I mean locations you use in your games. For example, a huge portion of my game takes place in the City of Rahesh, from Dragon Magazine Issue 372. I printed out the whole article and it’s part of my binder, for easy reference. 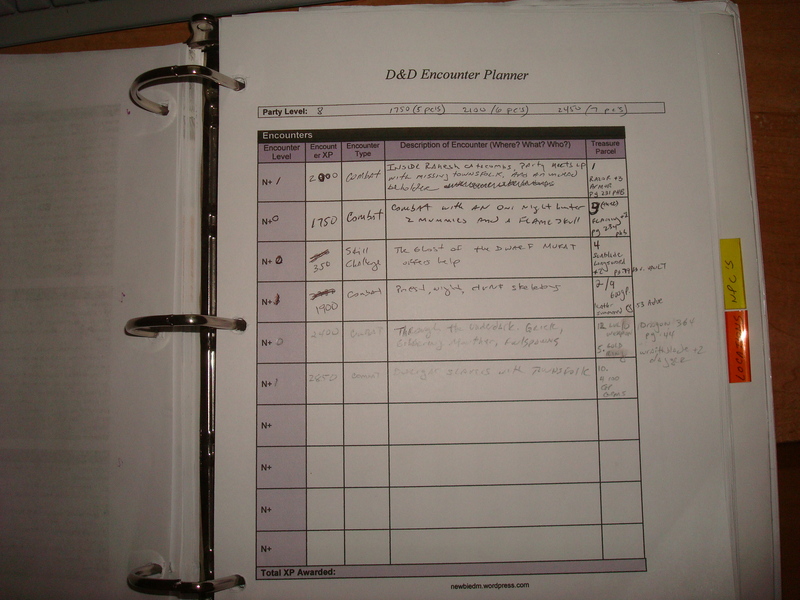 Keep everything that needs to be referenced in your binder. I also have sheets for skill challenges in there as well. As you can see, for me my binder is a necessary utility in my DM’ing. Yours should be on your bookshelf along with your books. Now, as an aside, I’m really glad to be back from vacation. I missed my blog and helping out fellow newbie dm’s, and I hope you enjoyed this article. When you copy stat blocks from the DDI compendium, what program do you paste them into to keep the formatting? What web browser to you use to pull them up? I’ve been having difficulty getting them to come out looking like that. Google Chrome is the best option for this. It needs a little bit of reformatting, but it’s good enough. I “print screen” and paste it unto a Word document. It’s easy, maybe I’ll write a tutorial for it. I don’t suppose you’d like to upload your level progression template somewhere? That would be a great resource for me and other DMs – I could make my own, but it looks like yours works so well. Nice post. 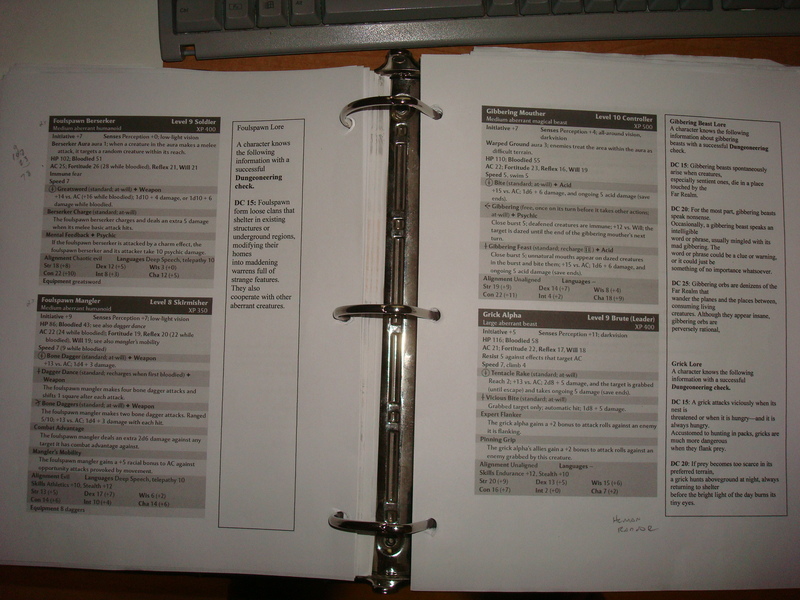 In today’s digital age a binder can easily be created with folders on your desktop. 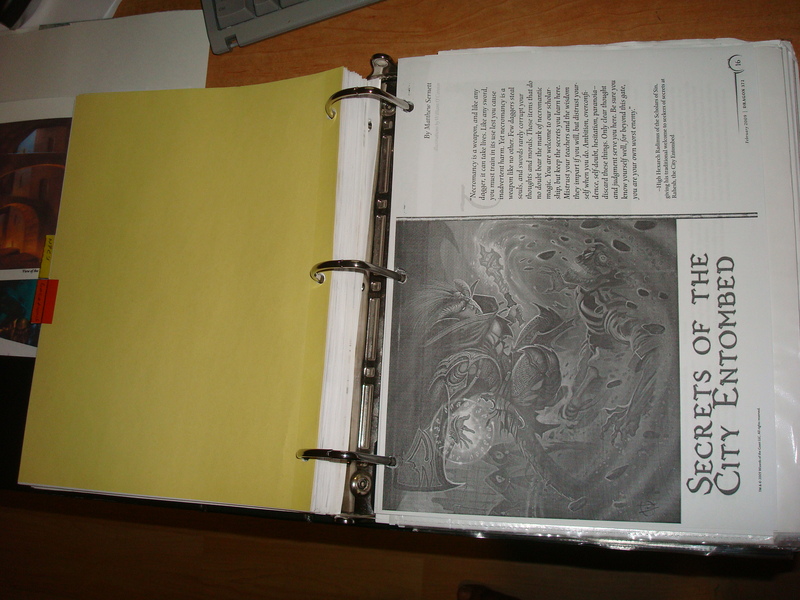 I use a large file folder to store any & all LFR/RPGA games i run, never know when I’ll need em again. About the DDI split: Heh I would suggest that, but half of the group (believe it or not) actually has no internet connection and their computers are almost a decade old. I may ask the other half, especially my neighbor, if they’d be interested. @mike: yes, believe me, digital tools are a huge part of my dm’ing, for prep only though… at the table i am fully analog. As usual some great tips. Thanks for hunting down the NPC collection link! @geek ken: as long as i keep finding stuff like that, ill keep posting up here! thanks for reading! so that’s how you do it Danelson, very interesting. An update, now with the Monster Builder, your job just got much easier. I have a screen capture and editing tool called Snag It. It let’s you capture an area or a window or a scrolling window. The editor portion let’s you crop, blur, draw on, etc and then you can send to a document or maybe paste into a pdf.